Samsung’s Galaxy S8 stands at the top of the pack of Android phones, though it’s bigger brother, the Note 8 may have an edge. But Google’s Pixel 2 is here, and looks to be a worthy successor to the original Pixel phone. Google’s first Pixel was an impressive debut, and the Pixel 2 improves on it, leaning from any past mistakes. It could give Samsung’s Galaxy S8 some serious competition. Let’s see how the two premium Android phones stack up against each other. Few phones can stand up to the design of a Samsung flagship phone, and that goes doubly for the Galaxy S8. It’s thin, sleek, and features Samsung’s incredible infinity display with curved edges and an incredibly screen-to-body ratio. Even though it has a 5.8-inch display, it’s not a massive phone, with dimensions of 5.86 x 2.68 x 0.31 inches and a weight of just 155g. The Pixel 2’s design, in contrast, is nothing to drool over. It’s simple and sleek, but doesn’t have the same impressive curved-edge screen or screen-to-body ratio as the Galaxy S8. The screen is sandwiched between sizable bezels that many flagships are doing away with. Both phones feature fingerprint scanners on the back. The Galaxy S8 scanner is awkwardly placed next to its rear camera, whereas the Pixel 2 scanner is more central, which could make it easier to find and naturally reach. And Google boasts having the fastest smartphone fingerprint scanner. The Galaxy S8 also has a heart rate scanner on the back and iris scanner on the front, features the Pixel 2 lacks. Both the Galaxy S8 and Pixel 2 are water and dust resistant, but Samsung scores higher points with an IP68 rating compared to the Pixel 2’s IP67. That means the Galaxy S8 can up to 30 minutes in about four feet of water, whereas the Pixel 2 shouldn’t go deeper than three feet. Both phones are protected by Gorilla Glass 5, which should withstand drops onto a flat surface from about five feet up. Neither phone has much in the way of color options. In the US, the Galaxy S8 only comes in Orchid Grey or Midnight Black (though there are additional options abroad). 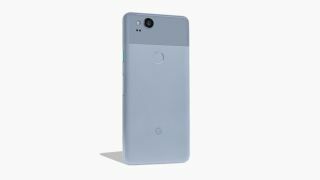 The Pixel 2 comes in "Clearly White", "Just Black", and “Kinda Blue,” giving it a slight edge. For music lovers, the Galaxy S8 carries on the legacy of the 3.5mm headphone jack, though its built-in speaker isn’t much for playback. On the other side, the Pixel 2 dumps the headphone jack in favor of the new wireless codecs for audio that come with Android 8.0 Oreo, and it has dual front speakers for stereo audio. In this case, the Pixel 2 gets another edge, as its lack of a 3.5mm headphone jack can be resolved with a dongle. Just as it's hard to beat a Samsung flagship, it’s hard to beat a Samsung display. The Galaxy S8 packs in a 5.8-inch Super AMOLED display with a resolution of 2,960 x 1,440 and an insane pixel density of 570 pixels per inch (ppi). The Pixel 2 also has an OLED display, but it will feel leagues behind at a small 5 inches and a resolution of just 1,920 x 1,080. These specs are more the kind to expect from a mid-range budget phone in 2017. For VR and streaming, the Galaxy S8 display clearly wins out with its more impressive display, even though both phones are compatible with Google’s Daydream VR. Despite its screen, the Pixel 2 may offer a better sound experience for watch movies and TV with its dual front-facing speakers. The Pixel 2’s Full HD display will help it save battery and processing power. But, the Galaxy S8 has the ability to downsample to Full HD for that same benefit, while the Pixel 2 can’t add more pixels on a whim. On the inside, the Galaxy S8 and Pixel 2 are packing similar internals. Both come with an octa-core Snapdragon 835 chipset, though the international version of the Galaxy S8 runs an Exynos octa-core processor. The Galaxy S8 and Pixel 2 both have 4GB of RAM. They both similarly start with 64GB of storage for the base models. The big difference lies in the operating system. Google’s new Pixel 2 beats the Galaxy S8 to the latest Android 8.0 Oreo operating system, and that gives it a leg up, since Oreo features impressive power-saving optimizations, and boosts the boot speed of devices. The Pixel 2 also prominently features Google Assistant, and lets users access it by simply squeezing the phone with its Active Edge technology. The Galaxy S8 is sure to eventually get Android Oreo, but currently it’s still running Android 7.0 Nougat. Until then, the Pixel is likely to feel like a speedier device thanks to the same processing power running on a more efficient OS. Google boasted the highest DxOMark score for a smartphone when it launched the first Pixel, and while we’ll have to wait and see just how well it performs out in the wild, the Pixel 2’s 12MP f/1.8 rear shooter exceeds the original's camera by scoring an even higher DxOMark score and topping all other smartphones once again. It also runs both optical and electronic image stabilization. The front-facing camera is an 8MP f/2.4 shooter, which should offer sharp selfies. The Galaxy S8 is known for quality photos, just like past Galaxy devices. It features a 12MP rear camera with a fairly wide f/1.7 aperture and optical image stabilization. On the front, it has an 8MP f/1.7 selfie camera. Both phones also have image recognition tools. Samsung has Bixby, which feels like more of a work-in-progress tool to help with shopping. Google is a bit further ahead with its AI, and Google Lens will help recognize photo subjects for organization and more. Google also puts its AI and dual pixel technology to work as a means of blurring out backgrounds similar to dual-lens systems. The Galaxy S8 has an on-paper win for its battery, as it fits in a 3,000mAh battery compared to the Pixel 2’s 2,700mAh battery. But, with the smaller and lower-resolution screen and the efficient OS of the Pixel, it’s possible that it could get better battery life in actual daily use. Both phones include quick charging. A price comparison is a bit hard to make between these two devices. The starting price for the Galaxy S8 is US$724/AU$1,199, while the Pixel 2 is a lower US$649/AU$1,079 (and includes a Google Home Mini for a limited time, at least in the US). Since the Pixel 2 is brand new, discounts that bring that price down substantially are going to be rare in the near future. On the other hand, the Galaxy S8 has regularly seen deals since it launched, with many bringing it below the US$600 mark and some hitting US$570, not to mention persistent buy-one-get-one deals from carriers. Without discounts, the Pixel 2 has an edge in the price competition, but Galaxy S8 prices have so frequently dipped, that it’s hard to imagine not being able to regularly find the Galaxy S8 at a lower price than the Pixel 2. The battle between the Pixel 2 and Galaxy S8 appears to come down to form and function. With the same hardware inside, the phones are left to duke it out with their looks and capabilities. While we still have to see how well Android 8.0 Oreo performs on the Pixel 2, it's like the phone will take a win in that category. And, though the Galaxy S8 has a great camera, it didn't receive the same record high DxOMark score for camera performance that the Pixel 2 did. So, the Pixel 2 is likely winning in the camera department. Especially with Google's AI helping out. The Galaxy S8 easily wins for visuals though. A vastly more impressive display and an elegant design make the Galaxy S8 look like it's in an entirely different league from the Pixel 2. Until we review the Pixel 2 and know how well it works, we can't say for sure which phone wins, but the Pixel 2 is likely to be a more useful and capable phone than the Galaxy S8. Meanwhile, the Galaxy S8 will win for its design and screen quality.